Free Home Evaluation – Clarksville Tn Real Estate - The Cash Team proudly serving the Clarksville, Fort Campbell, Sango, and Pleasantview areas. In the Clarksville TN area as with most areas in the United States - Price Sells. 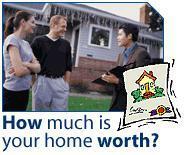 The correct selling price of a home is the highest price that the Clarksville Real Estate market will bear. To assist you in determining the correct asking price we provide you with a comprehensive market analysis of comparable properties sold and offered for sale in your neighborhood. To provide a more detailed Comparative Market Analysis, we would be more than happy to also assess your listing in person at no obligation to you. During this meeting we will also provide you with helpful tips to better prepare your home for sale. If honest answers are what you are looking for, you came to the right place. Pam and I believe in being honest and upfront just as we would want if we were in your shoes. We will give you and honest assessment and will not stretch the truth just to gain your business. Simply enter your criteria below, and we will provide you with a speedy response. The more information given, the more accurate the evaluation. All information you provide is secure and will be kept strictly confidential. There is no obligation. Please indicate when you are thinking of selling and if you are moving within Clarksville or relocating outside Clarksville. If you prefer, please feel free to contact us a 931-338-1375.